The spectacular setting in the chapel of St Anne, in the cathedral of Gyor, for the Irish Madonna. When Cardinal Tomás Ó Fiaich returned to Ireland his news was disappointing. 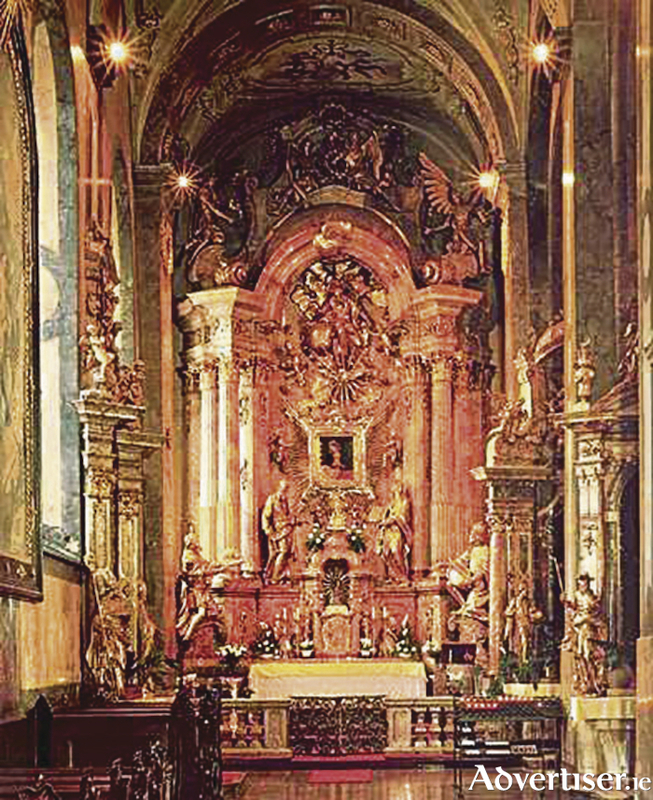 Intrigued by Canon Quinn’s unfounded pronouncement that the large stone frame in the Lynch’s chapel in St Nicholas’ Collegiate church had once contained the miraculous painting of the Irish Madonna, he made inquiries when he visited Gyor in 1983. “Having looked carefully at the size of the picture (26’’x20” ) I must admit I cannot say one way or the other whether the picture was ever in Galway. It is much smaller than the reserved space (in St Nicholas’ ) but I couldn’t get any accurate measurement…” said the cardinal choosing his words carefully. As a small consolation he brought back a copy of the painting which hangs in St Nicholas’ today. It hangs, however, in a different place to the so called ‘empty frame’ as it would be ridiculously lost within such a large space. Two years later Canon Quinn’s speculation was blown out of the water by Dr James Mitchell, a renowned Galway historian, and a stickler for knife edge accuracy. Writing in the Galway Archaeological and Historical Journal* Dr Mitchell was exasperated by the good canon’s guess work. He dismissed it as ‘whimsy’ and a ‘figment of imagination’. He regretted that it had become a ‘tradition’, ‘legend’ and a ‘fact’ in a short space of time, when it was utterly devoid of both historical and contemporary credibility. It would have been unusual that such a valued picture was never mentioned in the Lynch archives. As recently as 22 years after Bishop Lynch had fled Galway, a Spanish scholar, Fr de Ayora, arrived in Galway researching the Lynch family. He was shown a manuscript which included local antiquities, and the most remarkable things that happened in the town. The Lynch family was referenced for their contributions to the ornamentation of the Collegiate church. No mention was made of any painting. James Hardiman, one of Galway’s greatest scholars, and author of the much respected History of Galway (1820 ), consulted Lynch descendants, who had detailed knowledge of the family’s municifence to the Collegiate church. Again no mention was made of any painting. Other scholars, who have written in detail about local antiquities, such as Mgr J Fahey,** do not mention the painting. Even the Rev J F Berry, who loved a good story, and in his The Story of St Nicholas’ Church (published in 1912 ), describes with some relish, the doubtful tale of Mayor James Lynch hanging his own son from a window in Market Street, does not mention any such tradition. The so called ‘empty frame’ never contained the Irish Madonna of Hungary. So what did the ‘empty frame’ signify? Dr Mitchell suggests that the empty frame, in the tradition (I think I can safely say that word in a new context ), of other near-by tombs, positioned, as it is, over the Lynch tomb, was probably meant to contain a plaque to commemorate the person or persons buried underneath. But for some reason it was never completed. Yet a real mystery remains: where did Walter Lynch get the painting? There are several interpretations as to its provenance. It has been described as a 17th century Italian painting. Other experts find traces of the Flemish school, of the same period; while someone else claims it is of Spanish origin. It is possible because the Lynch family’s trade with Spain was significant, the picture could have been brought to Galway then and kept privately by Walter. He trained to be a priest in Penal times and had to study abroad in Lisbon and France. The picture could have been bought at either place. We are told that when he eventually arrived in Brussels in 1653, he was ‘living in great need.’ He hardly had money to buy a painting. Yet, the people of Gyor are adamant that when he arrived in their city he had the painting with him. None of this speculation takes one whit from the importance, and the significance for the Hungarian people of this beautiful picture, and its astonishing miracle that was witnessed by hundreds on St Patrick’s Day 1697. It is an extraordinary story. Perhaps Dr Mitchell will turn his forensic skills to the mystery of the picture’s origins, and unravel the last piece of the Irish Madonna jigsaw. NOTES: *Fiction and The Empty Frame: Gyor and Galway, Vol 40 (1985/1986 ). **Author of The History and Antiquities of the Diocese of Kilmacduagh. Dr James Mitchell will not be in the least surprised at the speed with which a made-up story can become a ‘legend’, ‘tradition’ and ‘fact’. He blew apart the ‘legend’ of the Lynch window from which Mayor James Lynch is supposed to have flung his luckless son with a rope round his neck in 1493 ….But don’t tell the tourists that the story is not true. It’s a Galway tradition.